Expanding on my last article, it is time to take the next step for those of you who are looking at perfecting your audio. You should already have a basic understanding of your recording equipment and streaming software. With that in mind, I’ll help you take it to the next level to make the most out of whatever setup you have. 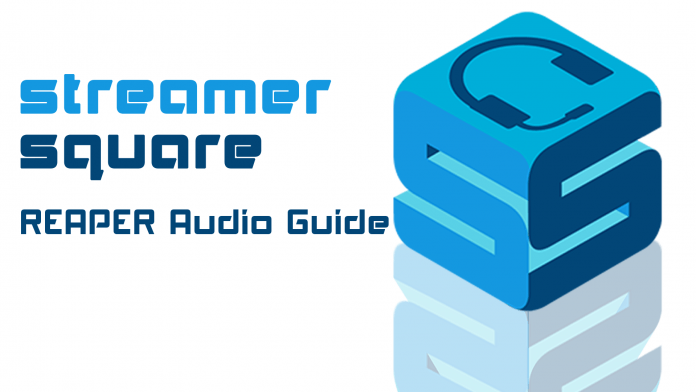 This guide will not only have tips on perfecting your audio but will also introduce you to my new favourite program, REAPER. REAPER is a DAW (Digital Audio Workstation) which allows you to record, edit, and mix audio both in post-recording and live. Of course, here we will be using it strictly during our livestreams but it’s nice to know you can use it for other applications. This guide is going to be a doozy, but don’t worry; I’ll hold your hand all the way! 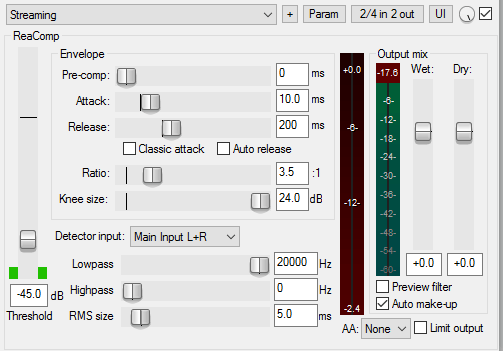 REAPER – The program we’ll be using to make your audio sound amazing. Now this isn’t a free program BUT it does have a great 60 day trial with ZERO restrictions. After 60 days I’m sure you’ll be able to decide if it is worth $60 (which is quite affordable for something like this in my opinion). Virtual Audio Cable – Just like a physical cable, this will route whatever is going on in Reaper to whatever you want the audio to go into. This means your audio can be amazing with programs such as Discord, Skype, or even in-game voice. After installing both applications, it’s time to open REAPER up. To anyone new, you will be welcomed with quite an overwhelming screen. Don’t worry, we won’t be using most of it with regards to livestreaming. If you do plan on doing recordings such as voice overs or music there are certain things you should know about the UI. For that, check out this great video by Booth Junkie for more of a UI introduction. REAPER has many uses but this guide will be strictly related to setting up for livestreaming. First, we need to set up REAPER to detect our microphone as well as configure the project settings. We’ll save the project after so you don’t have to fiddle with this stuff every time you open REAPER up. After opening up REAPER, hit Ctrl + P to open up the Preferences window. Alternatively, you can go to Options in the top bar to find it. For Audio system keep it as WaveOut. It’s the most reliable and easiest for most systems to use. Make sure your Input device is set to your microphone or in my case using an XLR setup, my audio interface. Change the Output device to the CABLE Input which was installed from the Virtual Audio Cable you installed earlier. For Buffers this is going to depend on your soundcard and also your CPU. The better your rig, the less buffers you’ll need. If you plan on adding lots of effects, you may want to consider more buffers. The latency listed will help you if you have problems with mic desync with a webcam. Too low of buffers and you may get stuttering so make sure to test and keep an eye on your CPU. I find the latency not to be too relevant during livestreams but for local recordings or live monitoring of your microphone, you’ll notice the latency. Hit OK and you’re done! Now to set up a Track for REAPER to use. Hit Ctrl + T to open a new track up. On the bottom of the screen and the left side you should see a new Track pop up. This is what we’ll apply effects to and is what Reaper will route to OBS. After that save the project so you don’t have to do set up every single time you open REAPER. There are quite a few dials but don’t be alarmed. We’re only worried about some of them. The first thing you want to do is click the little red button on the left . This “arms” the track so it can be detected/heard. After arming it should light up and you should see your Microphone levels being detected when you speak. Then click the button underneath for Record Monitoring until it is turned on . This will provide a live audio signal for REAPER to output through the Virtual Audio Cable. Lastly, before we start to add any effects you’ll want to turn down the input volume of your microphone. If you’re like me using an audio interface, this can be done by turning down the Gain knob very low. On my audio interface I have the gain turned to around 20%. If you’re using a USB microphone with a Gain knob like the Blue Yeti, you will want to do the same. Additionally, you may also want to go into the Windows settings to turn down the input volume there as well. You can do this by right clicking on the sound icon in your Windows toolbar, going to Recording devices, finding your microphone’s properties and turning the slider down in the Levels tab. Lower down to around 25% for a starting point. You may be thinking “But Kiratze, if my microphone levels are turned down to near zero, won’t I be extremely quiet?”. If you weren’t using REAPER, yes, but REAPER will do the heavy lifting and adjust your audio levels properly. The reason we start with lowered volume is to avoid clipping/peaking at the source and then turning up the volume from there. Starting with good audio and raising the volume is much better than starting with terrible sounding audio and then lowering. Depending on your setup, you may benefit more from a higher gain on the knob in addition to the settings. Just make sure to figure that out first, because if you change the gain knob after you’re done with the REAPER settings you will need to re-adjust to compensate for the higher gain. A good rule of thumb is to have the mic gain as high as possible BEFORE you start clipping/peaking. The gain knob on my Audio Interface generally sits around 20%. The compressor will do lots of the work to prevent peaking but you want to make sure you’re not peaking at the source already. Now is the time to connect REAPER to OBS, or whatever broadcast software you’re using. This is important so you can use local recordings to test how you sound in OBS. 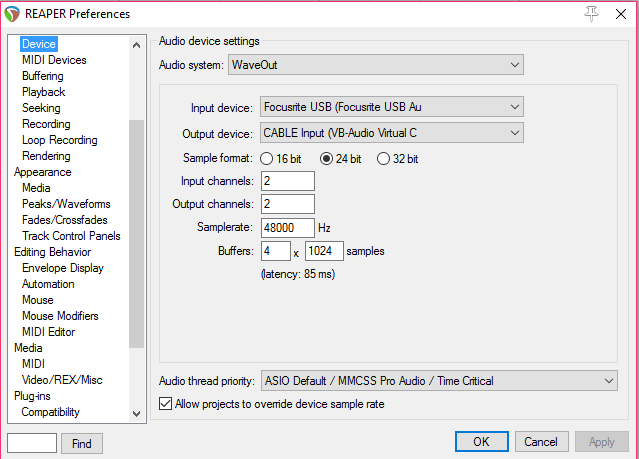 In order to get the benefits of REAPER in whatever program you use, all you have to do is make sure your Input device is set to the CABLE Input just like in REAPER. The picture below is what it looks like in OBS Studio. REAPER is the first thing your audio goes through, so it can apply all the effects when using other programs such as Discord, Skype, or even In-Game VOIP. This means you don’t have to set up anything but through Reaper. Time to add the effects that will make your audio sound fantastic! There are three that we will focus on; Noise Gate, EQ, and Compression. A Noise Gate is an effect that helps reduce the amount of background noise that goes on when you’re not speaking. It will not activate your microphone until a sound gets above a certain Threshold (ideally your voice in this case). So when set up correctly, things like mechanical keyboard clicks, computer fans, and other unwanted noise won’t be heard by your viewers (unless you’re speaking). First thing is to open up the FX window. You can do this by going back to your Track and clicking the green FX button . Additionally, when you’re ready to test you can click the Power button attached to the FX button to turn effects on or off to see the difference going on with your voice. Once you get more familiar with REAPER, there are plenty of fun effects you can choose here to add to your voice. For now, type “ReaGate” into the Filter bar at the bottom. Drag the effect into the FX: Track 1 window that should still be open. If it isn’t there, you can drag the effect right on to the Track in the main window as well. We won’t be talking about every parameter here since most aren’t going to be applicable. Once you have things set up it will require quite a bit of testing on your part to figure out what works best for you. Every voice, recording environment, and microphone set up is different so what may work for me, may not work for you in terms of the numbers. My pictures can give you an idea of what to start with though if you’re completely lost. Threshold Slider – This is the slider on the left of the window. The green bars on the side represent your sound level currently going into your mic. The key here is to set the slider slightly above your background noise or any noise you want to cut out. If you have a loud keyboard or mouse you may want to do some test typing/clicking and see how high the green bars jump. The Noise Gate works by deactivating your microphone until sounds get higher than the Threshold. That’s when the “gate” opens and lets noise through. Attack – This is how fast the gate opens once a sound breaks the Threshold. You shouldn’t have to stray from the default (3ms) too much. If you yell lots on stream or maybe speak quietly at times; you may adjust this more. You’ll not want to make the attack too long though as that can start cutting off the start of your sentences. Hold – This is how long the gate is held open once the sound gets back under the Threshold. The higher you go, the longer the gate is held open so if you put it too high you’ll start having that unwanted noise after you’re done speaking. However, too fast and you’ll start cutting off the ends of your sentences. Release – This is how slowly the gate closes. You’ll want to balance this with your Hold. It’s good to increase this a bit since it won’t make the gate closing as “sharp”. So rather than your sentences ending quite abruptly, it’ll be more of a fade so it sounds more natural as your unwanted noise is getting cut off. 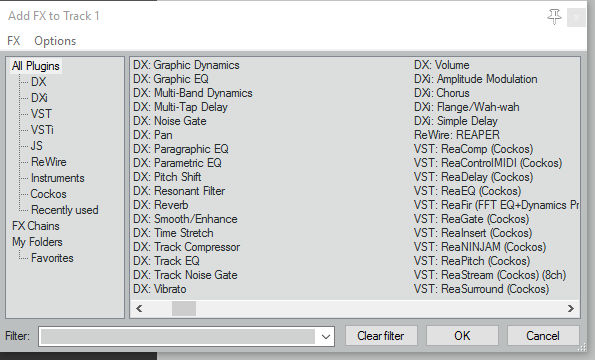 Highpass – This is what frequencies the microphone detects on the lower end. Anything under 80Hz will generally be unnecessary noise such as low computer hums, thumps, or bumping the desk. Dry – There are two sides of the audio signal for each effect; dry and wet. Dry is how the signal sounds originally and before it goes through the effect. Wet is the signal afterwards. Sometimes an effect does a bit too much to your voice. To reduce that, the Dry slider will help add back in more of that “original” sound. I find for voice, things sounded best for me around -30dB. Set the Highpass to 80Hz-90Hz to get rid of the unnecessary low frequency noise. Figure out what background noise you want to cut out and adjust the Threshold slider accordingly. After that use the Attack, Hold, and Release commands to find the best balance between cutting out the unwanted noise while preserving your voice. You can test by doing local recordings in OBS. Your voice will change real-time as you adjust sliders in Reaper. Do short tests and listen back after the recording is over! After finalizing your tests, make sure to save the Noise Gate so you don’t have to make a new one if something goes awry. You can save a new preset by clicking the button. This goes for all the effects we’ll be applying. A Compressor is one of the most helpful effects in a streamer’s arsenal. It will help you sound more level overall when talking and reduce any clipping/peaking issues that normally distort your audio when speaking too loud or yelling. Most of these settings will be determined by how dynamic you are on stream and also things such as your microphone placement. With the FX: Track 1 window still open, go to the FX drop down menu and click “Add FX…“. Just like last time we’ll use the search bar at the bottom to find our effect; ReaComp. Select it and hit “Ok” to add it to the effects chain. A quick note on order. If you plan on adding many effects, your audio passes through the effects top to bottom as they appear in the window. Things can sound different depending on the order! Like before, I’ll only be going over the necessities. Some of the settings will be familiar from the Noise Gate effect. Feel free to do your own research if you’d like to learn more about the program! Threshold Slider – Just like the Noise Gate, the Threshold is the point at which the effect will activate. In the Compressor’s case, it will lower the volume of your microphone a certain amount depending on how high above the Threshold you get. You’ll want to set this slightly above your normal speaking level. This is because you don’t want to compress your normal speech; only the loud parts. Talk in your normal speaking voice and you should see where the green bars peak. Around 5dB-10dB above that is a good place to set the slider. Attack – How fast the Compressor kicks in after sounds get past the Threshold. Since we’re focused on reducing sudden loud yells or speech, a faster attack is best to lower those peaks. Release – How fast the Compressor stops working once back under the Threshold. You generally want a longer release (but not too long) to have a smoother transition to your normal volume level. Ratio – This is the level at which the Compressor adjusts your volume once it is past the Threshold. I find between a 3:1 or 8:1 ratio for voice tends to be good. The louder you get, the higher Ratio you’ll need. For example, my Ratio is currently set to 3.5:1 (Three and a half to one). So for every 3.5dB over the Threshold I get, my outputted volume is only 1dB. If I yelled for 7dB over the Threshold? My outputted volume would only be 2dB over the Threshold. Math! Knee Size – This one is a bit more complicated but all you need to know is it affects how the Compressor kicks in as it gets closer to the Threshold. We generally want a smooth transition from our normal voice to our louder voices so a high or “soft” knee is best. As the volume gets closer to the Threshold, the Compressor kicks in more and more as opposed to kicking in only when the Threshold is broken causing it to be very noticeable. This is one of the few settings that I can say a higher number is better regardless of your other settings but of course feel free to test yourself. Wet – The audio level after being compressed. You may want to raise it slightly if your mic is still too quiet. Less so if you’re using Auto make-up. Auto make-up – Check this button to turn on Auto make-up. Since our Compressor is going to be making our voice quieter than normal, we’ll need a way to turn the whole thing back up. Auto make-up will increase your volume depending on how much the Compressor is kicking in. For voice, it is fine to use this and you generally shouldn’t need to do much more. If it’s still too quiet you can use the Wet slider right above it to increase your volume or the Gain slider in your Track (not the Master track). Remember though, everyone’s setup is different so play around with and without Auto make-up as well as the Wet and Gain sliders. You may have to adjust your Noise Gate settings alongside your volume. Speak into the mic like you normally would during a stream. Place the Threshold slider around where the green bars peak. Next, speak louder or more excitedly. Maybe even yell like you would on stream. Don’t try to peak the microphone but imagine you just got surprised or scared on stream. You should see the areas where you peak since we haven’t applied any settings yet. If there ever is red at the top of the Master Track or the Output mix meter in the Compression window , you’ll need to lower the volume somewhere. 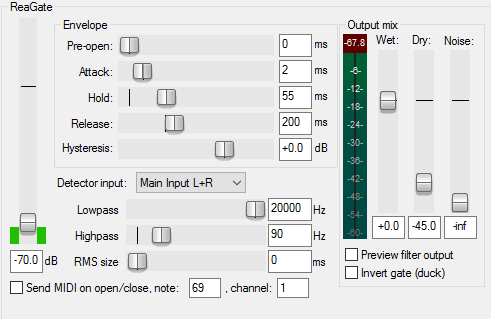 The Output mix meter shows what your viewers will be hearing while the dark red bar just to the left of it shows how much compression is being applied. Now that you know how much you peak during the loud noises, adjust your ratio to a number you think will best reduce your peaks without totally slamming down on your volume. Now when you do your same yells/screams/loud noises, it should be much better. If you are still peaking you can turn down the gain using the Wet slider or the Track gain slider. Next adjust the Attack and Release to your liking. Attack should be fairly fast since you want to tame those peaks sooner. Release should be slower to make the loud and the quiet transition between each other better. After that’s done you can check the Auto make-up button as well as play around with the Wet slider to put the final touches on your Compressor. Play around with the settings as you speak loud/yell and see what sound best for you. I am going to put the EQ last because while it can be helpful, it is VERY complicated and is not as important as the Noise Gate or Compressor. If you are a tinkerer and don’t mind spending more time on how you want your voice to sound, an EQ can give you lots of control over enhancing your voice. Because the EQ is tough to explain without visuals below is a video to help speed things up. For those not wanting to tinker around too much but still want to get something out of the EQ, you’ll only need to listen to the first half of the video. Whew, that does it! You are now on your way to perfecting your microphone audio. Make sure to save the project in REAPER as well as your FX presets to avoid having to adjust all the settings each time you open REAPER. It likely will require many hours of testing to get things right but when you do, you’ll love how your stream sounds even more! I put at least 2 hours just in the ReaEQ to give you an idea of how much tinkering you can do. That being said, I am picky so you can likely get away with just the basics. Don’t be afraid to do your own research though because there are lots of other guides, tutorials, and videos on REAPER and what else it can do. This is only the tip of the iceberg! Feel free to leave a comment with any questions or get in touch with me in the StreamerSquare Discord. I’d be happy to help if you’re still running into problems.